You know it’s going to be a great episode of Parks & Rec when every single character makes an appearance within the first few minutes, and most of them get a scene all to themselves. Even though Leslie is in the midst of paid suspension, she manages to give everyone in the office their holiday gift, via her press secretary of sorts Ann Perkins. She frames one of Andy’s Mouse Rat albums in a gold record frame, and Andy is so excited that he wants someone to take a picture of him holding it so he can frame it. Donna receives a zebra-print jacket with the words “You can get it” embroidered on the back in hot pink. Tom’s pocket watch isn’t a watch at all; Leslie took out the clock part and put a little thing that reads, “Baller time.” She somehow painted (or commissioned) a picture of April slaughtering the Black Eyed Peas. While Ron was out of the office, she installed automatic doors that close around him merely with the push of a button. And most thoughtfully, she bought Jerry some socks. The point is that Leslie Knope does a whole lot—she’s caring and thoughtful , and wants to be the most caring and most thoughtful, always. “Citizen Knope” celebrates Christmas in Pawnee, but it’s really celebrating Leslie by letting those closest to her bask in and pay tribute to her glory. There isn’t much she can do herself. Since the hearing, she’s been on forced leave from the office, and her attempts to sneak paperwork out to her house have been thwarted by Chris (in a Bumbleflex shirt, no less). Meanwhile, Ben is out looking for jobs in the private sector, a task that merely relies on Leslie for moral support, not actual connections or networking prowess. Leslie’s stuck at home, eating salgur and anxiously counting down the minutes until she can go back to work and actually make a difference. Ben has a brilliant idea though: She can’t work for the government, but she can enact change as a private citizen. Which to Leslie doesn’t mean showing up for a few meetings and voicing her opinion, it means organizing a task force known as PCP to make some demands of city hall. The whole “Leslie doesn’t know when to stop” aspect of tonight’s storyline has been done before countless times. I mean, that’s basically Leslie’s MO: She’s an overindulger, incapable of restraining herself when she gets excited about something, which is just about everything. It bothers me in episodes like “End Of The World” because she’s so far beyond the rest of the characters that she seems loony and cartoonish by comparison. But think of her exuberance like a comedic game she’s playing—when the rest of the characters play along, it becomes an accepted part of the Parks & Rec world, and a hell of a lot more fun to watch. It’s like… here’s an example of what I mean, since I was just thinking about this earlier today. I’m currently teaching a workshop up in the Bronx for this awesome arts education group I work with called The Story Pirates. (Kristen Schaal is one of the founders, FWIW.) The kids are sweet as can be but really beaten up by the system. A lot of them go nuts when it comes time for our afterschool programming, and frankly, I don’t blame them. They take multiple buses to get to class, to learn things they’re told to care about. They’re wiped. And when little kids get wiped, they get loopy, like they’ve eaten a bunch of spaghetti covered in salgur. They run around by themselves, throw their papers up in the air, literally scoot themselves back and forth along the floor like they’re in The Three Stooges, that sort of thing. And it’s not everyone, just a few. But what I’ve noticed is that every other kid, even the ones who really want to listen and do our fun activities, will always bring themselves up to the energy/attentionless level of the outlier kid. So if this one little boy is at a 9 out of 10 and everyone else is at a 4 or 5, His presence brings everyone to at least a 7 or 8, sometimes a 9. If he has to go home, suddenly the entire room mellows out. In any case, Leslie’s that 9, and when everyone else stays at the 4 or 5, she looks like a whack-job. 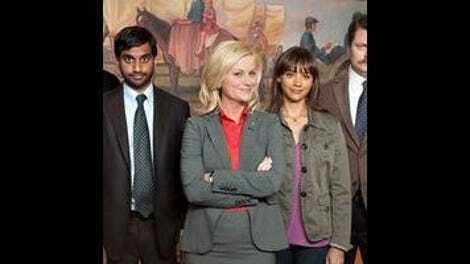 But in “Citizen Knope” everyone rises to match her. (That’s a long way to say that. But this is TV Club after all. You’re welcome.) At first the members of PCP are there simply to voice their concerns; after a few minutes with Leslie, they’re fired up and wearing matching T-shirts, recruiting new members everywhere they go. And the rest of the characters, so moved by Leslie’s thoughtfulness, decide to do her one better and craft an office replica out of ginger bread and candy. They spray M&Ms silver; they eat said M&Ms; they watch as ginger bread walls crumble under the normally steady hand of Ron Swanson; they celebrate when Andy Dwyer shows off his prowess with frosting and cookies. They’re driven by the fire of a thousand Leslie Knopes, and it’s a pleasure to watch them work together and pull off something impressive. One of the only disappointing things about “Citizen Knope” is that while it did include every character, few of them got much time to shine. That’s just the way it’s going to be with a limited amount of dialogue and more actors to split it with, so I get it. I guess I’m just a sucker for giving over huge chunks of episodes to a few people and letting the others orbit around them for a bit. Not surprisingly, I really enjoyed Ben’s journey from unemployment to unemployment, taking a pit stop at a boring accounting office—to work as an in-house accountant—and the torturous workplace of Dennis Feinstein, who hunts man on vacation and is played by the incomparable Jason Mantzoukas. Both jobs seem like a bust, so Ben decides to take the lesser of two evils and go with the accounting firm one; then Jean-Ralphio shows up and delivers one of the finest monologues he’s ever performed. Ben shouldn’t be rushing into the workforce and taking some job that has nothing to do with his passions—like model trains, or toy Gandalfs. He needs to figure out what he really wants to do, not just what he’s always done. After each step of the process, Ben and Leslie share a meal together and talk about what Ben’s been going through. It’s the first time we’ve witnessed the two of them working as a couple, and although Leslie can occasionally monopolize the conversation, they seem to really listen to each other and freely offer up support and advice. The episode ends with Leslie excited for Ben’s great unknown (that has nothing to do with resigning in disgrace), and Ben excited for Leslie to see the surprise her co-workers have put together for her Christmas gift. It took a while for Leslie and Ben to have an honest relationship, but it seems to have been worth the wait. That credits sequence with Jean-Ralphio was pretty incredible. All in one take? Let’s do that for an entire episode! And let Jean-Ralphio’s hair fly free.